Welcome to my new blog – At Monika’s Place! I’m still doing a little bit more “construction” over here to get everything the way I want it. This will be my new blog home from now on. If you receive my blog updates through email – it should automatically convert to this new blog. I’m starting something new for 2018 – Mail a Card Monday – #mailacardmonday. Every Monday I plan to send out at least one card and I’m challenging everyone else to join me! This was my mailbox when I was sending out Christmas cards – so I’m not sending out that many every Monday. I’m challenging everyone to send out at least one card each Monday for the whole year! That would be 52 cards. Last week Monday was a holiday but I got my cards in the box – I had 4 go out last week. So they really went out on Tuesday but I had them in the box. Today I mailed out 7 cards and had to resend one Christmas Card. Throughout the week I make myself a little list of who I need to send cards to and then on Sunday’s I’m getting them together. I really do love to decorate the envelopes. So if I don’t already have a coordinated envelope I’m try to make those real quick on Sunday night. Will you join me? I’m posting on my Instagram and on my Facebook Page and Group. Be sure to share a picture with me and a comment and let me know you are playing along. Last Friday I was scheduled to have a Wrap Up the Holidays class but mother nature didn’t like that idea. Instead we had snow! Which is not normal for us – I live in Georgia – we average maybe 1-2″ of snow in a whole year and that’s usually in Jan/Feb time frame – occasionally in March. Rarely in December. But this weekend we got about 8″ of snow at my house! So since my class was cancelled I decided to be brave and do a FB Live on my Stamping Together At Monika’s Place Facebook page instead. It was my first real one on my page where I showed a project. You can visit my page to watch it if you haven’t already. It’s a set of tags featuring the Card Front Builder Thinlits dies and the Wood Textures Designer Series Paper Stack. I also made a little box to hold the tags. 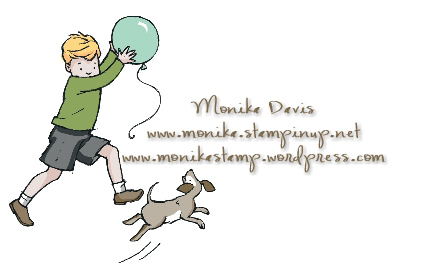 Then on Sunday I got an email from Stampin’ Up! that they are offering a surprise Free Shipping day on Monday – December 11th – that’s today! It’s a Surprise from Stampin’ Up! FREE SHIPPING! 24 hours only Monday, Dec. 11, 2017. 12:00 AM to 11:59 PM (MT). – if you just need one small item or a whole cart load – order on Monday and it ships free! Use the Host Code = Y6DEERDN when you checkout. For orders over $25 I’ll mail you the consumable supplies to make the tag project above. Don’t forget about the Year-End Sales Event and Clearance Rack for last chance items and savings. I’ve been having fun playing with the new Stampin’ Blends. I wanted to show you one of the cards I made. I used the new Stampin’ Blends with the This Little Piggy set. She is so happy on my card. Did you know you can also color the pearls? I have a little tiny pearl in the center of the flower and it’s colored with the Pool Party Blends to match the flower. Have a happy day! Thanks for stopping by. Order the new Stampin’ Blends today. Don’t forget about my giveaway for orders in my store through Nov. 15th – read more about it here. It’s time for the popular Christmas Card Stamp a Stack class! Come make a stack of beautiful handmade Christmas cards to send to family and friends this holiday season. 4 card designs and you will make 5 of each one for a total of 20 cards. Please bring your own adhesive or plan to purchase some here. Bring a pair of paper snips and you may also want a bone folder. Or $20 with a qualifying product order. *Please note that I do a lot of prep work for this class. If you are unable to attend and I’ve already cut your supplies you still need to pay for the class and I will give you the supplies along with photos of the completed cards for you to finish on your own. Thanks for understanding.